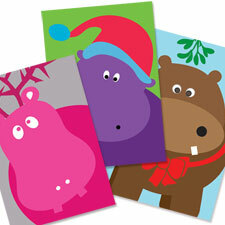 Our brightly colored abstract hippos are delightful fun for your holiday card sending. Each features a darling hippo with a special motif: Santa hat, mistletoe and ribbon, and antlers. You get three each from our Hippo Holidays collection: three Brown Hippo With Mistletoe, three Pink Hippo With Antlers, and three Purple Hippo With Santa Hat. Our note cards are a Hippo Mojo exclusive, designed by us and professionally printed on glossy cover stock. Inside, the cards read, "Hippo Holidays."